10in by 12in .025 metal with four 1/8in mounting holes and 1/4in rounded corners. 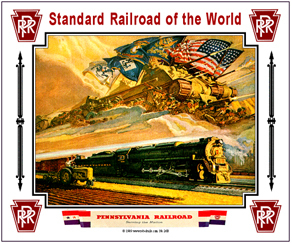 Patriotic scene of a Pennsylvania Railroad War Train, World War II tank and Farmer in the field, all doing their part to support the troops. Onward to Victory, as America's Railroads moved military troops and materials to feed the war effort. Click on above image for zoom.